It's hard to believe the summer is coming to an end. Soon the beach chairs will be packed away, along with the swimsuits and sun tan lotion. This time of year is always bittersweet for me because even though the heat can take a hike at this point, I still relish in the lazy days of summer and everything that goes along with it. For this post of Sweet Summertime Reads I thought I'd do a recap on the favorite books I read over the last few months + a few of my other favorite things that happened this summer. I hope you all have enjoyed this summer long feature as it comes to a close next week. We've all got something fun planned for our final post next week, so be on the look out for that. Got to spend an extra long weekend on Lake LBJ with my family. Texas summers are HOT, so any vacation time spent here is always near a large body of water. This lake in particular was gorgeous & we had tons of fun taking the boat out. Definitely want to go back again. Traveling to Chicago & hanging out with two of my good friends (Tara + Anna) was definitely a highlight of the summer! I love this city because of its diversity (plus it was a great break from the heat!). Everything from the delicious food + drink, to visiting the beach was perfect. I love a good beer & I definitely sampled a few I found to be tasty this summer. Blue Moon with an orange wedge will still be one of my favorites though. I also had a birthday this summer, so that called for cupcakes of course. And I can never pass up Panera's seasonal eats -- mmm blueberry oatmeal. Because why not? 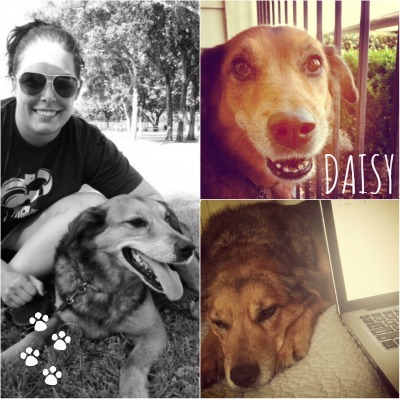 I talk a lot about my sweet Daisy on the tweets & post pics on instagram -- so of course she gets a mention on my blog! We had a rough few weeks at the beginning of summer (in & out of the vet), but we're healthy & happy now! What have been some of your favorites this summer? Share in the comments: favorite books read? favorite places you traveled to? favorite eats + drinks? and any other sort of favorite moment from the summer! 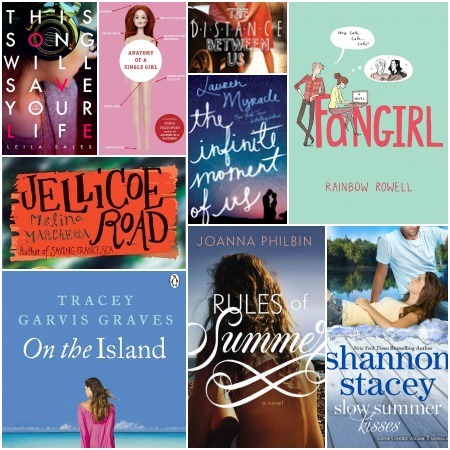 Check out Estelle + Magan tomorrow, then again with Tara on Thursday, for more Sweet Summertime Reads! I loved The Distance Between Us, too, and I'm about 75% done with Fangirl, and I am loving it! Rainbow Rowell just has this way of writing . . . I just love it. Aww ... love the pics of Daisy! And so many great vacations so far! I'm sad that all I've done is stay home. :( I looooved On the Island!! Glad it's one of your favourites! I LOVE Chicago, cupcakes, and Blue Moon beer. I've also found Summer Shandy beer to be delish and refreshing. We've had beautiful cooler weather in Ohio this summer and swimming laps with friends in the outdoor pool has been awesome. I've also enjoyed reading new-to-me authors of The Sea of Tranquility and Me Before You. But the best part of this summer has been starting a new job that pays well! Sounds like a good summer! I finished Fangirl yesterday and that's definitely my favorite read of the summer and maybe the year. I cannot wait to read This Song Will Save Your Life, hopefully that will be on my favorite fall reads :) And the best place I traveled to was Yosemite National Park. It was amazing, probably the coolest place I've ever been.